Celebrate Life Through Music and Dance! The Wake Forest Academy of Fine Arts is dedicated to offering a curriculum of Performing and Creative Art study in a fun and exciting atmosphere. Great care and individual attention is given to nurture the ability of each student.The Academy offers a staff that is both college and professionally trained in each instructor’s area of expertise. Emphasis is placed on proper technique and professionalism. 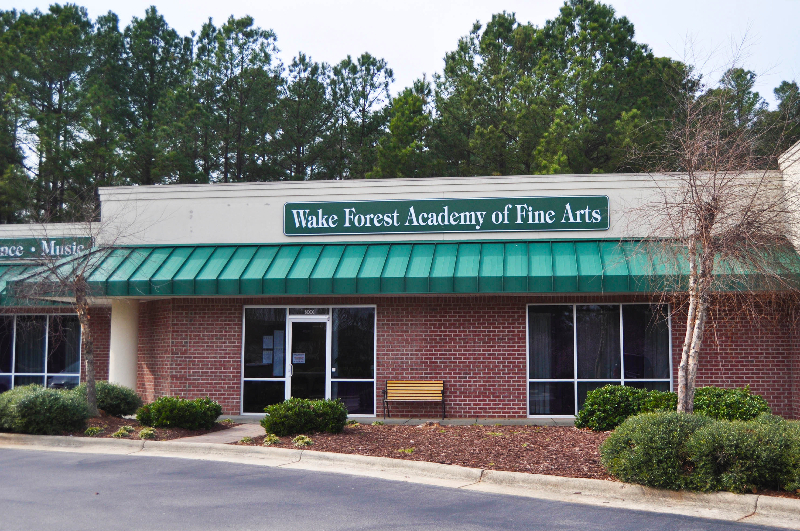 The Wake Forest Academy of Fine arts was started in 1991 on South White Street in Down Town Wake Forest. For 18 years Mary Taylor Land has been the Artistic Director of the Academy. After being down town for 12 years the studio has since moved to a newer facility on Durham Road. The Wake Forest Academy is proud to be one of the premiere dance studios for dancers in the North Raleigh, Wake Forest, and Youngsville area! Your professional source for dance and music education. The Wake Forest Academy of Fine Arts is dedicated to offering a curriculum of Performing and Creative Art study in a fun and exciting atmosphere. Great care and individual attention is given to nurture the ability of each student. The Academy offers a staff that is both college and professionally trained in each instructor's area of expertise. Emphasis is placed on proper technique and professionalism. The Academy offers an exciting and creative atmosphere while encouraging every student's individual appreciation for the arts. The Academy is a 5,000 sqft top of the line studio! There are 3 dance studios within our facility. Each studio has floor to ceiling mirrors and sprung floors. Sprung flooring helps to protect our dancers while dancing. The sprung floors act as shock absorbers when dancers jump and dance across the floor. The advanced flooring helps to prevent injuries and enhances the dancers performance! Our studios are equipped with JVL audio systems for great music in every class. The Academy has 2 bathrooms as well as 2 dressing rooms for our dancers and parents! There is a spacious lobby to wait in while you dancer is in class and is a great place for dancers to do home work in between classes! Info:Our year-end recital“KALEIDOSCOPE” is in May. Performance is part of learning and all Academy dancers must participate. There is a $25.00 recital fee due with your April Tuition ($25.00 for the first child and $10.00 for each additional child). The recital fee is used to rent the auditorium, hire a stage manager, technicians, etc. Each family will receive two free tickets to the recital and additional tickets can be purchased at a minimal cost. Info: Here at the Academy we have 7 award winning competition teams. We have 6 groups that are a part of our “Company”. Company dancers compete at a recreational level of competition. They are invited by the teachers to be a part of the team. These dancers dance a total of 3 hours per week for technique and rehearsal. They attend 3 regional competitions every season. National Competitions are optional. We also offer a Competitive team. These dancers take a minimum of 9 hours a week of dance. They attend 5 Regional competitions and one National.